Though waking up with puffy eyes happens to many, dark circles and under-eye puffiness can start to linger or become more noticeable due to age and the breakdown of fat and collagen. Retinol helps with cell turnover and collagen synthesis, and can be used for restoring and reviving skin around your eyes. There are many eye creams available that contain retinols to help you look rested and refreshed, along with other ingredients to soothe the sensitive skin in the eye area. Although you can use any retinol face cream under your eyes, a formula especially made for this delicate area helps prevent sensitivities or reactions. There are retinol eye creams made for use during the day or at night, sensitive skin versions that contain soothing emollients, and time-release formulas that slowly release retinol to help prevent inflammation or redness. Over-the-counter face creams may contain up to 2 percent retinol, the highest percentage permitted by the FDA, although most retinol eye creams contain much less, usually around .5 percent. Look for retinol creams with complementary active ingredients such as caffeine, which constricts blood vessels, reducing puffiness and the appearance of dark circles; hyaluronic acid, which helps moisturize and plump skin, reducing the look of lines and dark circles; and vitamin C, a popular antioxidant that can firm and brighten skin. Cleanse and dry your face as usual, and apply a small amount of retinol cream to your under-eye area. Apply every other night to start; too much retinol can cause skin irritation. Begin daily use after a few weeks if you haven't experienced side effects such as redness or dry skin. Keep skin moisturized. Use eye cream daily, especially in the first few weeks while your skin acclimates to retinol. Apply eye cream on top of your retinol cream to combat any retinol-induced dryness. Also, use UV protection daily. 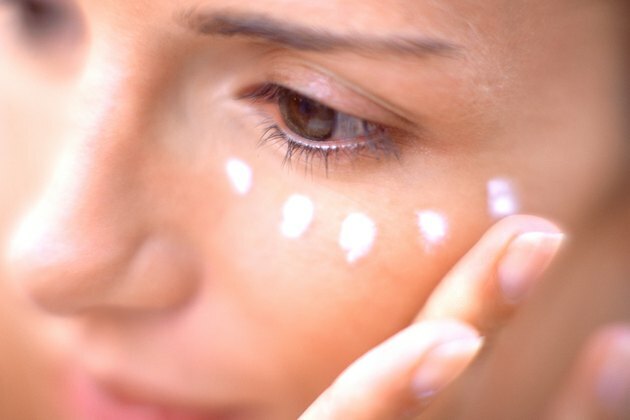 While the risk of increased sun sensitivity due to retinol is minimal, the skin around the eyes is thin and especially vulnerable to sun damage. Regular sunscreen may irritate eyes so looks for sensitive skin formulas for the face or those formulated especially for the eye area. Skin may be more sensitive to retinol in the sun or during winter months when skin is drier. Cut back on the number of days a week you use retinol if you experience redness or dry, flaky skin or peeling. Retinol may aggravate skin conditions such as rosacea, excessive dryness or sensitive skin. Consult a doctor or dermatologist for treatment advice for your skin issues.